I love colored mascara. 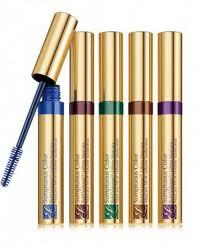 My fav one’s are by Estee Lauder Sumptuous Color Mascara as shown above. It gives you that extra umph but it can still be sophisticated. If you’re a minimalist try this trend by adding it to just the tips of your top lashes or to just your bottom lashes. If your more adventurous add it to all of your top lashes for a big pop of color. I for one, always use either the green or purple colored mascara. The blue is also a fun choice. Have fun with this and choose what works best for you. Enjoy!